Suzuki has previewed the all-new Jimny. The long-awaited SUV will go on sale in the UK in 2020 and be powered by the same range of 1.0-litre BoosterJet and 1.2 DualJet petrol engines as the Swift. Prices should start in the region of £12,500. The boxy, upright design of the old Jimny has been carried over to the new model along, with tough plastic wheel arch claddings and a tailgate-mounted full size spare wheel. However, a new interior should address the refinement shortcomings of the old car and provide a low-cost alternative to the Defender, which was axed by Land Rover in 2016. As before, the Jimny is built on a lightweight ladder frame chassis with a low range transmission and lockable differential that should make it apt for tackling heavy mud, snow and sand. The petrol engines are expected to mirror the latest Swift, with the 111PS three-cylinder BoosterJet offered alongside the 90PS four-cylinder DualJet. There won't be any diesels, but a hybrid version could make it to the range. 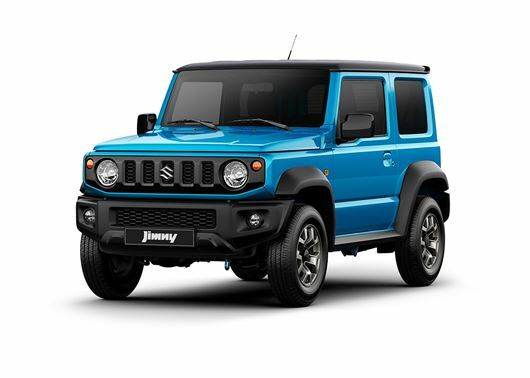 All models get a part-time four-wheel drive system that can be activated on the move, while a low set of gears should give the 2020 Jimny the same edge as its predecessor off-road. Like the rest of the Suzuki range, standard equipment should be generous with all getting touchscreen navigation, DAB audio, reversing camera, air conditioning and alloy wheels as standard. A cracking little Jeep that looks honest and durable. I hope it sells well for Suzuki. Seems like a good update, looks-wise. Hopefully it'll ride and handle far better than the current long-in-the-tooth model, which was no good on-road but surprisingly agile off-road. Given how cheap it is likely to be, it could be a hit for people in rural areas without £25k+ for a decent 4x4 from other makes. I liked the now defunct previous Vitara 3dr for its looks, but it was so heavy on the jungle juice with that big engine - both are the sort of car a small petrol turbo would be suitable for. 2020?! But I want one now! But seriously, I hope Suzuki don't get too ambitious with the pricing like they have with the Swift Sport.......but maybe they've learned that lesson judging by the recently announced £1500 launch discount on that car. All websites are reporting two Jimny versions; a home market Kei class 660cc narrow car and an international Sierra wider car. Indian commentators talk of a K15B 1.5 litre updated engine, built in India. It appears this same single engine may be used internationally rather than the 1.0 boosterjet. But the K series stats appear old school, in particular for the UK CO2 emissions of 154 g/km manual and 170 g/km auto. With the automatic being a four speed. And to top it all fuel economy similar to the third generation version.